Background and Aims: Clinical adrenal insufficiency has been reported with doses of inhaled fluticasone proprionate (FP) >400 μg/day, the maximum dose licensed for use in children with asthma. Following two cases of serious adrenal insufficiency (one fatal) attributed to FP, adrenal function was evaluated in children receiving FP outwith the licensed dose. Methods: Children recorded as prescribed FP ⩾500 μg/day were invited to attend for assessment. Adrenal function was measured using the low dose Synacthen test (500 ng/1.73 m2 intravenously) and was categorised as: biochemically normal (peak cortisol response >500 nmol/l); impaired (peak cortisol ⩽500 nmol/l); or flat (peak cortisol ⩽500 nmol/l with increment of <200 nmol/l and basal morning cortisol <200 nmol/l). Results: A total of 422 children had been receiving FP alone or in combination with salmeterol; 202 were not investigated (137 FP within license; 24 FP discontinued); 220 attended and 217 (age 2.6–19.3 years) were successfully tested. Of 194 receiving FP ⩾500 μg/day, six had flat responses, 82 impaired responses, 104 were normal, and in 2 the LDST was unsuccessful. Apart from the index child, the other five with flat responses were asymptomatic; a further child with impairment (peak cortisol 296 nmol/l) had encephalopathic symptoms with borderline hypoglycaemia during an intercurrent illness. The six with flat responses and the symptomatic child were all receiving FP doses of ⩾ 1000 μg/day. Conclusion: Overall, flat adrenal responses in association with FP occurred in 2.8% of children tested, all receiving ⩾1000 μg/day, while impaired responses were seen in 39.6%. Children on above licence FP doses should have adrenal function monitoring as well as a written plan for emergency steroid replacement. In 2001, a 5 year old girl presented to a hospital in the West of Scotland with a day’s history of vomiting, impaired consciousness, and visual disturbance. She developed progressive unconsciousness and seizures and died within nine hours. Postmortem examination showed cerebral oedema and small adrenal glands. Four weeks later, her 7 year old brother was admitted with almost identical symptoms. He had hyponatraemia and cerebral oedema but responded to intensive care. After discharge, his initial plasma cortisol was noted to be inappropriately low (225 nmol/l). Subsequent adrenal testing showed a severely impaired cortisol response (<30 nmol/l) to a low dose Synacthen test (LDST). Both siblings had been receiving fluticasone proprionate (FP) for asthma for a number of years in doses of up to 2000 μg/day. We attributed these events to acute adrenal insufficiency induced by high dose FP. This led us to screen adrenal function in all children with asthma attending the respiratory clinics at the Royal Hospital for Sick Children, Glasgow who were recorded as receiving FP outwith the manufacturer’s licensed dose (>400 μg/day). Our primary objective was to identify any child with evidence of adrenal insufficiency, and ensure they had adequate adrenal replacement therapy and a plan for emergency management of symptomatic acute adrenal insufficiency. There are few published studies of adrenal function in large numbers of children with asthma using high dose ICS.9–11 Here we report the results of adrenal function testing in the children screened. Electronic versions of clinic letters of children attending the specialist respiratory clinics were searched for the words “fluticasone”, “flixotide”, or “seretide” and then scrutinised to identify every child prescribed inhaled FP >400 μg/day between January 2000 and April 2002. Parents and GPs of these children were sent an explanatory letter with an appointment for adrenal function testing. At testing, the nurse inquired about the current inhaled FP dose, any dosage changes in the last six months, the inhaler device used, and the number of oral corticosteroid rescue courses in the last year. We did not attempt to assess compliance with inhaled FP. All children who attended were tested, even if more detailed inquiry at the time indicated that their FP dose was now within license (⩽400 μg/day). Children were asked to fast from midnight and to omit any morning oral, but not inhaled, medications. The endocrine nurse explained the testing and the reasons for it. A brief enquiry was made for symptoms of chronic adrenal insufficiency. Height was measured using a calibrated stadiometer and weight measured using electronic scales. Where both parents attended, their heights were measured and a mid-parental height calculated. Following application of local anaesthetic cream, the children were cannulated between 08 00 and 10 00 hours. Adrenal function was assessed by a synthetic ACTH (Synacthen) test using a modification of the low dose protocol of Crowley and colleagues.12 Briefly, the Synacthen dose was calculated on the basis of body surface area, giving 500 ng/1.73 m2, and prepared using serial dilution of 250 μg Synacthen in 10 ml saline. Venous blood samples were taken at time zero, and at 15, 20, 25, 30, and 35 minutes thereafter. Serum cortisol was measured by immunoassay (Immulite 2000, Diagnostic Products Corporation, Los Angeles, CA, USA). Flat: peak ⩽500 nmol/l with increment <200 nmol/l and basal morning cortisol <200 nmol/l. Data were summarised using standard descriptive statistics. Relationships between variables were investigated using Pearson’s correlation. All analyses were done using Minitab (Version 14) with a significance level of 5%. Because of the serious adverse events encountered locally, it was considered clinically essential to check whether other children receiving high dose FP had evidence of adrenal insufficiency. The investigation plan was agreed with the Medical Director. In the circumstances, we did not consider it appropriate to obtain permission for testing from the local ethics committee. All parents were given a written and verbal explanation of the reasons for testing their child. Between January 2000 and March 2002, 422 children were identified as prescribed FP, either alone or in combination with salmeterol (seretide). A flow diagram shows the number of children identified at each stage (fig 1). Two hundred and two children were not tested for reasons listed in fig 1. Consort diagram of children studied. Table 1 presents demographic details of the 220 children in whom testing was attempted. Children received FP from a metered dose inhaler with spacer (137/ 220; 62%), or as a dry powder. In 192 children, we had details of the duration of FP prescription (median 4 years; range 0–9). Height and weight standard deviation scores for the 220 children are in table 1, for all subjects and after sub-division according to FP dose. There was no correlation between total daily FP dose and either height (r = 0.037, p = 0.612) or weight (r = 0.099, p = 0.161). In those children where mid-parental height SD scores (SDS) were available, there was no significant difference between the child’s height SDS and the mid-parental height SDS (paired t test, p = 0.563, 95% CI −0.219 to 0.398). The adrenal responses classified on the peak cortisol result and the FP doses at the time of testing are shown in table 1. Testing failed in three subjects. Of the 192 receiving FP ⩾500 μg/day successfully tested, 6 (3%) had flat, 82 impaired (43%), and 104 normal (54%) responses. Of the 25 receiving FP <500 μg/day at the time of testing successfully tested, none was flat (fig 1) and four were impaired (16%). There was a weak but significant inverse correlation between peak cortisol and total daily dose (r = −0.213, p = 0.002). Correcting the total daily FP dose for subject’s weight did not improve the correlation (r = −0.193, p = 0.006; fig 2). There was no relationship between peak cortisol level and age (r = −0.018, p = 0.794; table 2) or number of acute courses of prednisolone reported as given in the previous 12 months (r = 0.046, p = 0.526; fig 3). Dose-response curve showing relationship between peak stimulated cortisol (nmol/l) on LDST and total daily FP dose (μg/day) corrected for weight. Relation between peak stimulated cortisol on LDST and number of courses of oral corticosteroid (nmol/l) reported as taken in the last year. There was no correlation between prescribed FP dose and the baseline morning serum cortisol levels (r = −0.115, p = 0.092). There was also no correlation between the number of children with baseline cortisol <100 nmol/l and FP dose (r = −0.152, p = 0.573) (table 1). Brief details of the children who had flat responses or symptomatic impairment are given in table 3. Of the six with flat responses, none had symptoms of chronic adrenal insufficiency. Two children had episodes of acute adrenal insufficiency: our index case (case 1, table 3); and one other (peak cortisol 289 nmol/l) who developed mild encephalopathy and hypoglycaemia with a tonsillitis who was the only one with symptoms of chronic adrenal insufficiency (tiredness, poor weight gain with dramatic improvement after adrenocortical replacement therapy) (case 7, table 3). No child with peak LDST cortisol levels of >300 nmol/l test presented with either acute or chronic adrenal insufficiency. Families and GPs were sent the results and a recommended plan including advice for managing any episodes of acute adrenal insufficiency (available from corresponding author on e-mail request). For all children, a focused effort was made at review to reduce the prescribed FP to a dose just sufficient to control the child’s symptoms. The identification and recall of all who had been prescribed FP >400 μg/day proved a major logistic exercise. While the majority were tested between May and December 2001, it was only by the end of 2004 (three years after our index cases) that we were confident that all at-risk patients had been contacted and given appropriate advice. Other estimates of the prevalence of biochemical adrenal suppression in children on high dose ICS vary. Our finding of 42% should be compared to the estimates of: 25% in the study of Kannisto and colleagues22 and 35% in the report of Broide et al in children and young adults,14 both using the LDST; 50% prevalence using insulin tolerance testing in the small study of Mahachoklertwattana and colleagues;10 and to the report of Fitzgerald et al where FP 750 μg/day was compared with beclomethasone dipropionate at 1500 μg/day in a 12 week randomised controlled crossover study—67% and 70% of children respectively had impaired adrenal function on LDST.9 These different prevalence estimates presumably reflect differences in the populations studied and methods used to characterise adrenal function. Nevertheless, they suggest that between one quarter and two thirds of children of children on high dose ICS will show biochemical adrenal suppression on sensitive testing. We did not find other features of corticosteroid excess. Only one child, who was also receiving daily oral corticosteroids, had Cushingoid features. We found no evidence of a significant dose dependent effect of FP on height.23 In children with mid-parental height measurements, there was no significant difference between the child’s height SDS and the mid-parental height SDS in keeping with a lack of significant growth suppression despite high FP doses. Dunlop et al also recently reported potentially severe adrenal suppression in some children who were growing at a normal rate despite taking high dose inhaled corticosteroids.23 Monitoring growth is, therefore, not an adequate screening test to identify children with adrenal suppression. We made no attempt to evaluate compliance with inhaled FP treatment. Non-compliance is well recognised in children receiving inhaled medications,26 has been shown to increase with duration of treatment,27 and is a potentially important confounder of any dose dependent systemic effects of inhaled corticosteroids. We found a very small although significant negative correlation between the daily FP dose and the peak cortisol level on LDST, similar to other studies. Sim et al reported a small but significant negative correlation (r = −0.42) between FP dose and peak cortisol on a short Synacthen test.11 The relevant graph in their paper (figure 111) shows a wide distribution of cortisol values at each FP dose level very similar to our own results (fig 2). Broide and colleagues14 found no relation between peak cortisol on LDST and daily dose of ICS. 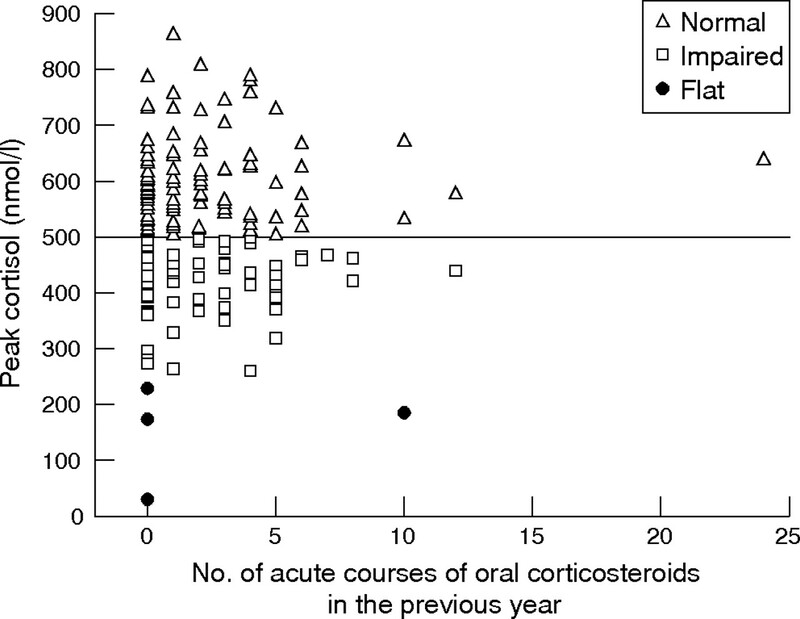 We also noted no relation between the number of reported rescue oral steroid courses in the last year and peak cortisol, although in some cases the reported number of courses used was improbably high. We speculate that the lack of a more definite relation between FP dose and biochemical adrenal impairment may reflect the effect of variable compliance. While we found only a weak negative correlation between FP dose and peak cortisol level, it is reassuring that a flat response was only found in children prescribed FP ⩾1000 μg/day. We conclude that families and clinicians should be aware of the possibility of clinical adrenal suppression in children with asthma on inhaled FP doses above license (>400 μg/day). Since adrenal insufficiency is easily treated if recognised, families with children on high doses of FP (and other high dose inhaled corticosteroids) should be aware of the possibility of acute adrenal insufficiency and the potential need for emergency treatment. We would recommend they carry a steroid card, and have specific written advice about steroid replacement in the event of severe intercurrent illness. Finally, these results support advice in current asthma guidelines to ensure that the dose of inhaled corticosteroids is only sufficient to control the disease and that doses be stepped down when control is achieved.29 In children with a poor response to treatment, ICS dose should not be increased without careful review. We gratefully acknowledge the calm forbearance of families and children prescribed off license doses of FP to adrenal function testing, the help of our consultant colleagues (Drs Cochrane, Gibson, and Devenny) in planning the testing protocol, and the assistance of all the nurses who performed the testing. We are especially grateful to Anne Wilson and Christine Kerr for their painstaking tabulation of all the data. Anon. British guideline on the management of asthma. Thorax2003;58 (suppl 1) :i1–94. Calpin C, Macarthur C, Stephens D, et al. Effectiveness of prophylactic inhaled steroids in childhood asthma: a systematic review of the literature. J Allergy Clin Immunol1997;100:452–7. Price J, Hindmarsh P, Hughes S, et al. Evaluating the effects of asthma therapy on childhood growth: what can be learnt from the published literature? Eur Respir J2002;19:1179–93. Todd GR, Acerini CL, Ross-Russell R, et al. 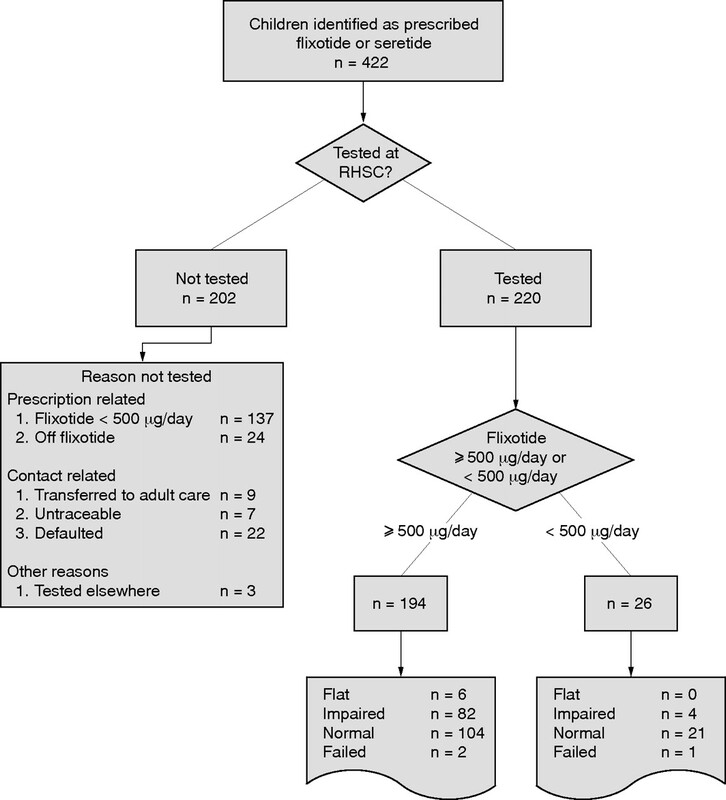 Survey of adrenal crisis associated with inhaled corticosteroids in the United Kingdom. Arch Dis Child2002;87:457–61. Patel L, Clayton PE. Adrenal insufficiency after treatment with fluticasone. Lowest possible dose of inhaled glucocorticoids should be given. BMJ2002;325:836. Fitzgerald D, Van AP, Mellis C, et al. 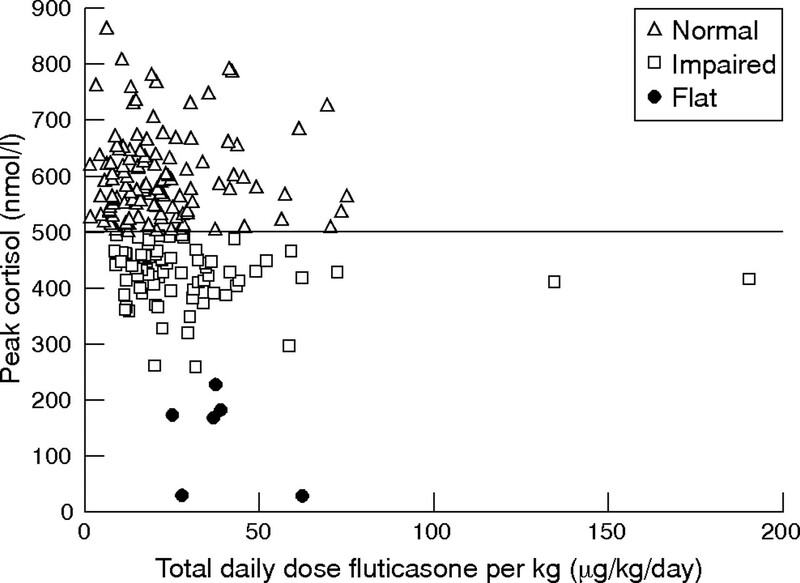 Fluticasone propionate 750 micrograms/day versus beclomethasone dipropionate 1500 micrograms/day: comparison of efficacy and adrenal function in paediatric asthma. Thorax1998;53:656–61. Mahachoklertwattana P, Sudkronrayudh K, Direkwattanachai C, et al. Decreased cortisol response to insulin induced hypoglycaemia in asthmatics treated with inhaled fluticasone propionate. Arch Dis Child2004;89:1055–8. Sim D, Griffiths A, Armstrong D, et al. Adrenal suppression from high-dose inhaled fluticasone propionate in children with asthma. Eur Respir J2003;21:633–6. Crowley S, Hindmarsh PC, Holownia P, et al. The use of low doses of ACTH in the investigation of adrenal function in man. J Endocrinol1991;130:475–9. Agwu JC, Spoudeas H, Hindmarsh PC, et al. Tests of adrenal insufficiency. Arch Dis Child1999;80:330–3. Broide J, Soferman R, Kivity S, et al. Low-dose adrenocorticotropin test reveals impaired adrenal function in patients taking inhaled corticosteroids. J Clin Endocrinol Metab1995;80:1243–6. Devoy M. Use of inhaled corticosteroids in children. Arch Dis Child2003;88:461. Adams NP, Bestall JC, Lasserson TJ, et al. Inhaled fluticasone versus placebo for chronic asthma in adults and children. Cochrane Database Syst Rev2005;CD003135. Masoli M, Weatherall M, Holt S, et al. Systematic review of the dose-response relation of inhaled fluticasone propionate. Arch Dis Child2004;89:902–7. Drake AJ, Howells RJ, Shield JP, et al. Symptomatic adrenal insufficiency presenting with hypoglycaemia in children with asthma receiving high dose inhaled fluticasone propionate. BMJ2002;324:1081–2. Todd GR, Acerini CL, Buck JJ, et al. Acute adrenal crisis in asthmatics treated with high-dose fluticasone propionate. Eur Respir J2002;19:1207–9. Kannisto S, Korppi M, Remes K, et al. Adrenal suppression, evaluated by a low dose adrenocorticotropin test, and growth in asthmatic children treated with inhaled steroids. J Clin Endocrinol Metab2000;85:652–7. Dunlop KA, Carson DJ, Steen HJ, et al. Monitoring growth in asthmatic children treated with high dose inhaled glucocorticoids does not predict adrenal suppression. Arch Dis Child2004;89:713–6. Brutsche MH, Brutsche IC, Munawar M, et al. Comparison of pharmacokinetics and systemic effects of inhaled fluticasone propionate in patients with asthma and healthy volunteers: a randomised crossover study. Lancet2000;356:556–61. Harrison TW, Wisniewski A, Honour J, et al. Comparison of the systemic effects of fluticasone propionate and budesonide given by dry powder inhaler in healthy and asthmatic subjects. Thorax2001;56:186–91. Gibson NA, Ferguson AE, Aitchison TC, et al. Compliance with inhaled asthma medication in preschool children. Thorax1995;50:1274–9. Jonasson G, Carlsen KH, Mowinckel P. Asthma drug adherence in a long term clinical trial. Arch Dis Child2000;83:330–3. Hawkins G, McMahon AD, Twaddle S, et al. Stepping down inhaled corticosteroids in asthma: randomised controlled trial. BMJ2003;326:1115. Competing interests: JYP has received financial support for clinical trials, attending conferences and postgraduate meetings, and from companies who make inhaled steroids, including GlaxoSmithKline, AstraZeneca, 3M Healthcare, and Novartis. His spouse has shares in GlaxoSmithKline, which makes fluticasone. Archives of Disease in Childhood 2006; 91 e6-e6 Published Online First: 21 Sep 2006. Archives of Disease in Childhood 2006; 91 799a-799a Published Online First: 21 Sep 2006. Very high dose inhaled corticosteroids: panacea or poison?